We are always looking for dedicated people to help us find tomorrows energy solutions. Your Questions, concerns and feedback are important to us. We're always available. 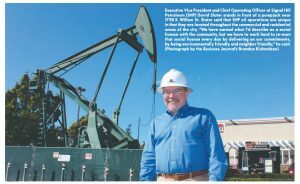 Some of the most productive oil and gas acreage ever discovered lie in the Los Angeles basin, creating unique opportunities and challenges. Access to all the latest articles and coverage related to Signal Hill Petroleum. WHAT IS YOUR ENERGY IQ? Know the real facts about energy reality and economics. Find out how oil and gas impact our everyday lives. SHP’s Executive VP and COO, David Slater, recently interviewed for the Long Beach Business Journal’s annual focus on Signal Hill. Slater shared insight on our company culture describing how, ” “We have earned what I’d describe as a social license with the community, but we have to work hard to re-earn that social license every day by delivering on our commitments, by being environmentally friendly and neighbor friendly,” he said. To read the entire article, click on the link below. Responsibility. We know the drill.